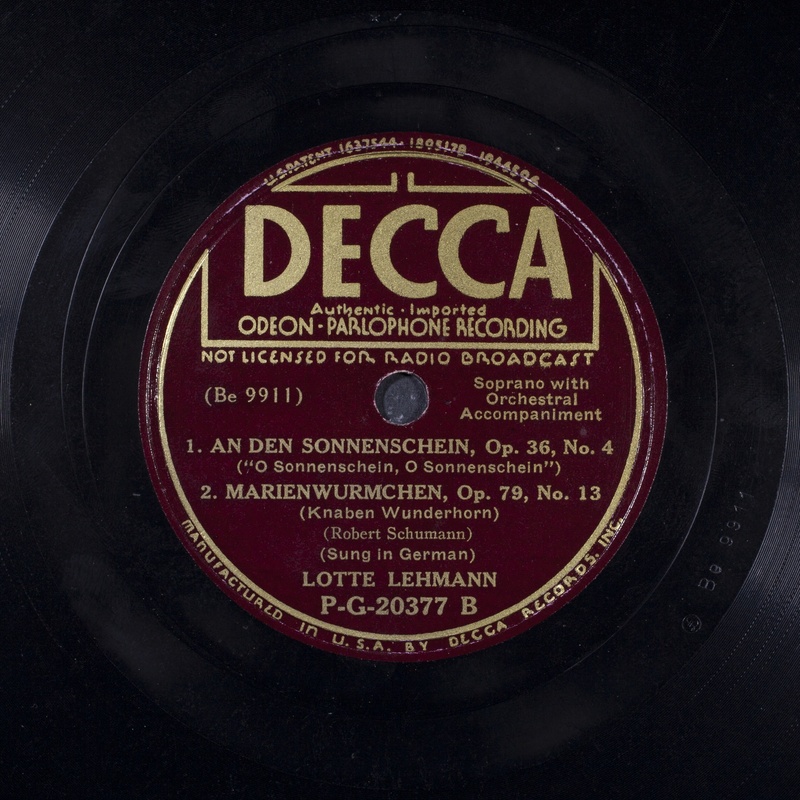 This is the only “sound-illustrated” Lehmann discography. This sound discography is in chronological order which allows one to trace the development of the artist. 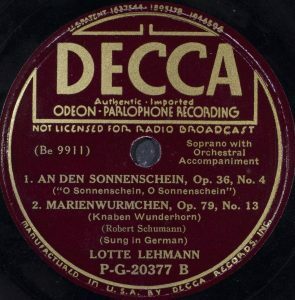 Lehmann recorded a lot and her voice recorded well, even before the use of the microphone. 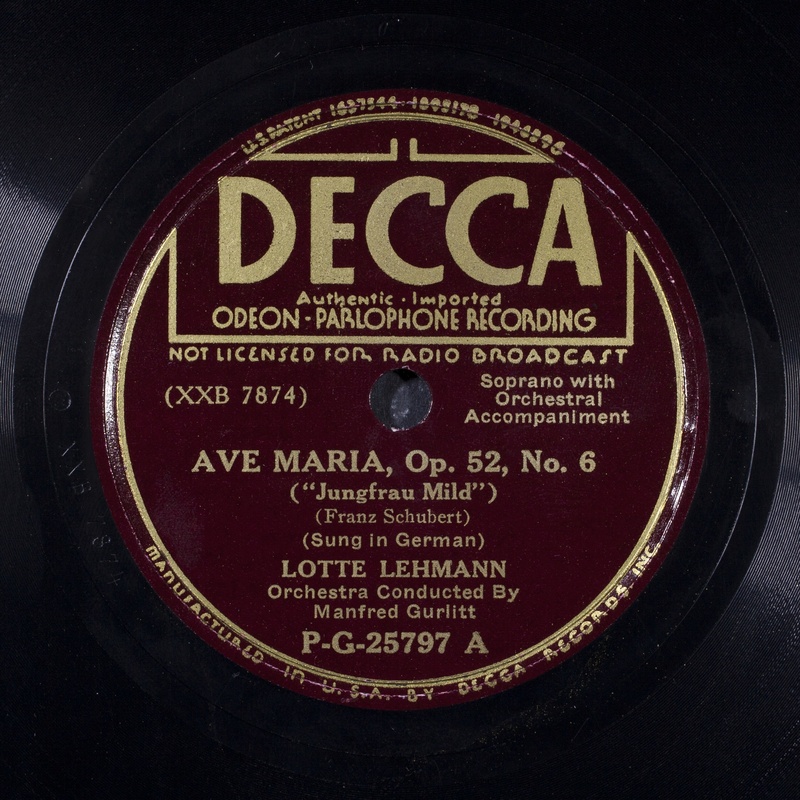 The recordings offered below are in mp3 format. 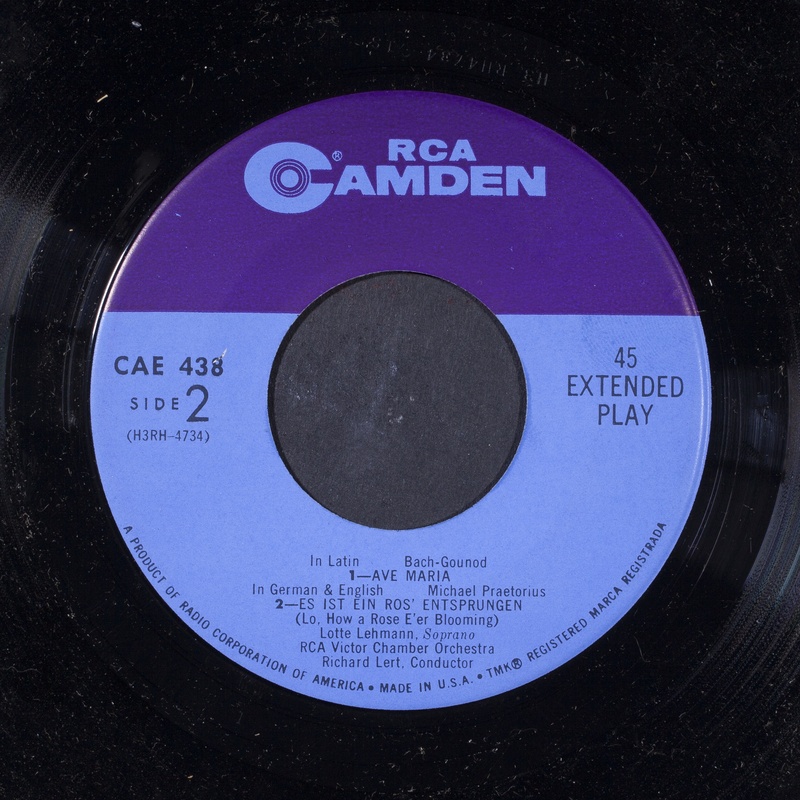 To get the real, authentic, and best fidelity, please buy and enjoy the CD, LP or 78rpm discs. 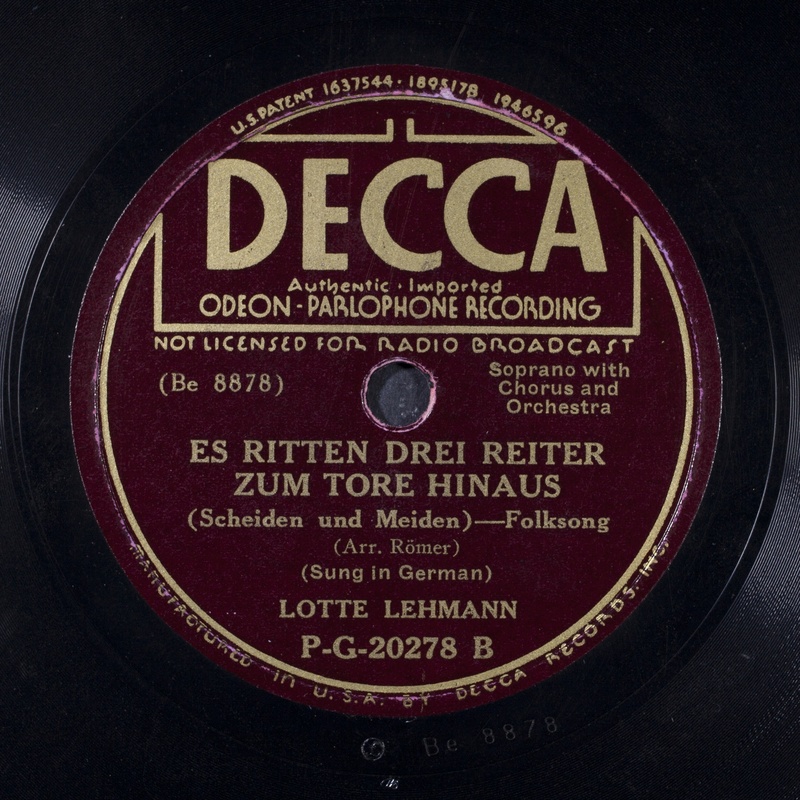 Naxos has a huge offering of Lehmann recordings, especially Lieder. Pristine, with its improved sound techniques, provides the important Rosenkavalier, Walküre and Schumann cycles. If you wish to find the particular CD that contains a song or aria that you’re looking for, please consult the CD index (in progress). The real, professional discographer, Floris Juynboll wrote a detailed introduction about Lehmann’s recordings for his discography found in Alan Jefferson’s bio. I recommend it to you. For information on early recordings, with some fascinating photos, click here. In the following list of recordings, once a date is given, that obtains until a new date is offered. I’ve simplified this page, so for complete discographical information, please see the discography for more detail. There you can also find the LP releases. 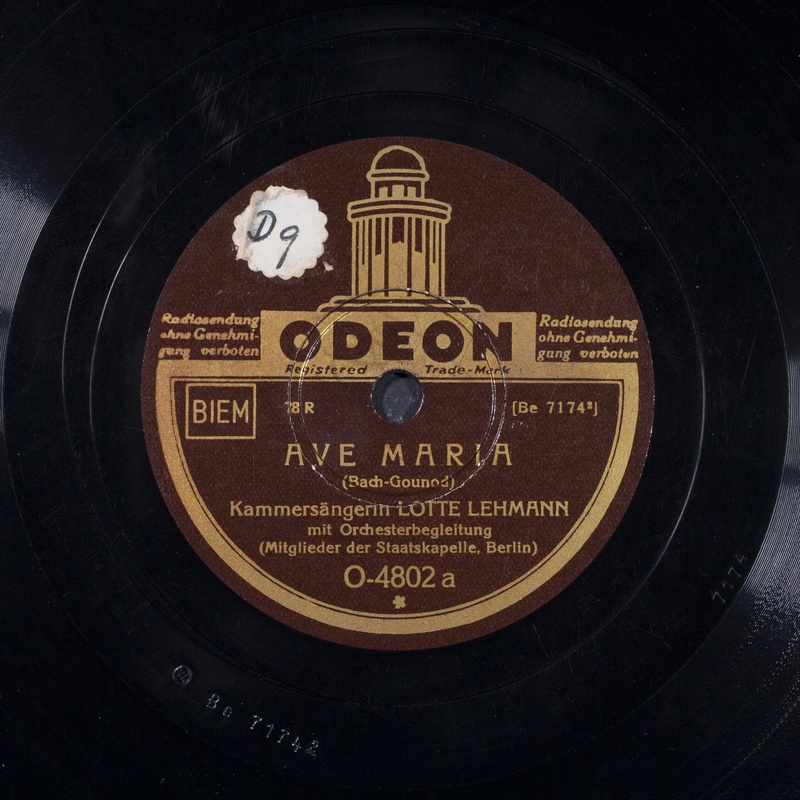 Two acoustic, single-sided, center start, etched label discs made in Berlin in 1914, possibly 87 rpm, 11 1/2″, entitled “Lotte Lehmann, Stadt-theater Hamburg.” No orchestra or conductor is known. from December 1916 to early 1921; dates listed are only approximate. All accompanied by an unnamed orchestra. The conductor was also not named. 006 CARMEN: Ich sprach, dass ich furchtlos mich fühle (Bizet); unpublished. 007 DER FREISCHÜTZ: Wie nahte mir der Schlummer (Weber); unpublished. 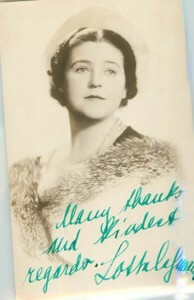 030 DIE LUSTIGEN WEIBER VON WINDSOR: Ha, er wird mir glauben; complete above. 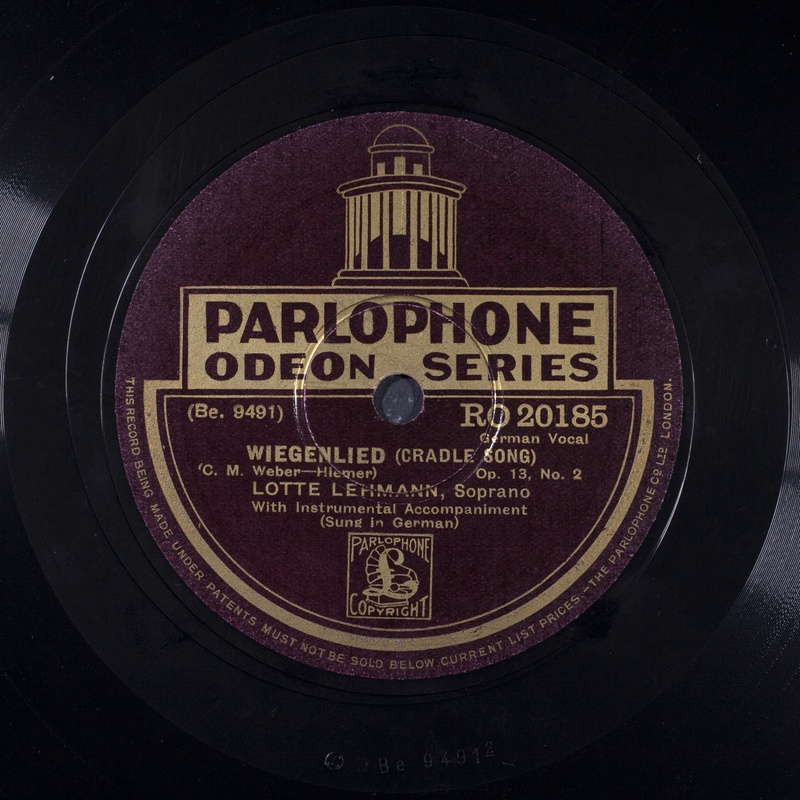 Acoustic 12″ recordings made from 1924-1926. 13 Feb.’24 Berlin State Opera Orchestra; c. Carl Besl (also listed as “Franz Besl”). 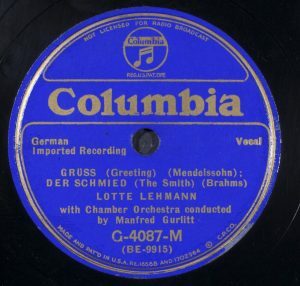 062 DIE TOTE STADT: Glück, das mir verblieb; (Korngold); this was so successful that it was re-released with an electrically recorded orchestra dubbed over the same acoustic recording; with Richard Tauber; 062 Glück, das mir Verblieb (electric orchestra dub); O – 9507 (acoustic original). 064 DER FREISCHÜTZ: Wie nahte mir der Schlummer; (Weber); see below. 066 DIE MEISTERSINGER: O Sachs! mein Freund! (Wagner); 066 O Sachs! Mein Freund! 069 MIGNON: Kennst du das Land, wo die Zitronen blühn? ; (Thomas); 069 Kennst du das Land, wo die Zitronen blühn? 074 a)Da unten im Tale b)Gute Nacht (Brahms); pianist, Hermann Weigert; unpublished. 074.1 Wiegenlied (R. Strauss); unpublished. 074.2 Freundliche Vision (R. Strauss); unpublished. 074.3 Morgen (R. Strauss); unpublished. 074.4 Mit deinen blauen Augen (R. Strauss); unpublished. 075 Allerseelen (R. Strauss); unpublished. 076 a)Zueignung b)Cäcilie (R. Strauss); unpublished. Odeon (Electric), Berlin 1927-1933. 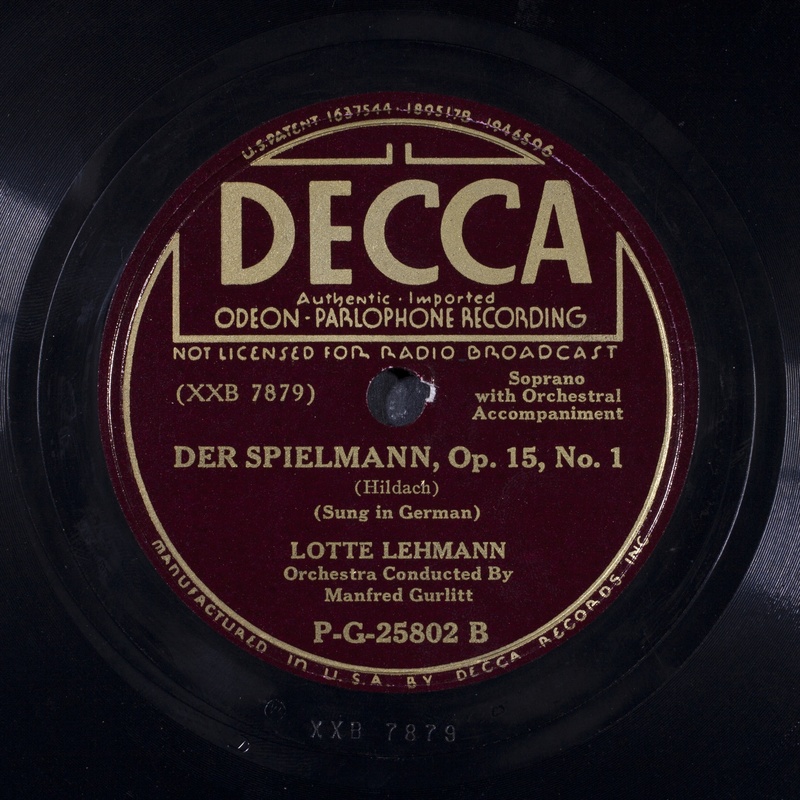 The “Berlin State Opera Orchestra” often means “members” of that group, especially when the accompaniment is listed as a “chamber orchestra.” These ensembles in general often received varying titles. 083 OBERON: Ozean, du Ungeheuer! (Weber); 083 Ozean, du Ungeheuer! 104 FIDELIO: Ich folg’ dem inneren Triebe (Part 2); complete above. 108 DAS WUNDER DER HELIANE: Nich hab’ ich ihn geliebt; (Part 2); complete above. 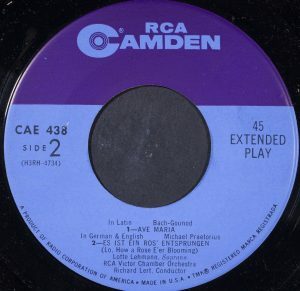 112 ARIADNE AUF NAXOS: Sie atmet leicht…Es gibt ein Reich; (take 2 begins 8 measures later); see 111. 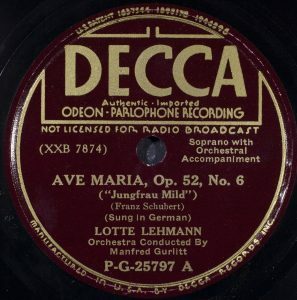 113 Ave Maria (sung in German) (Bach-Gounod); not published. 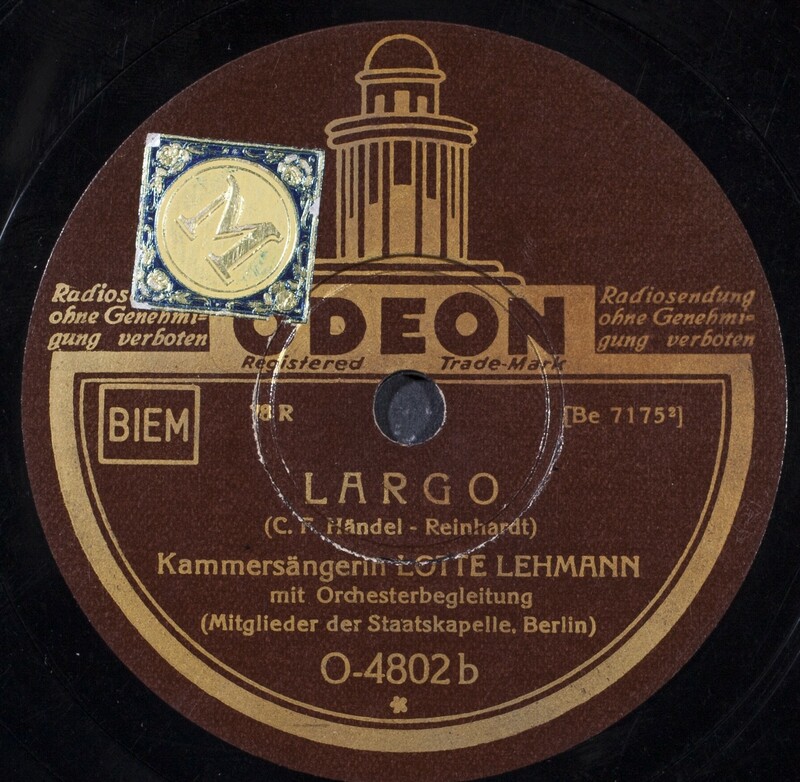 114 XERXES: Largo (in German) (Handel); not published. 144 DER FREISCHÜTZ: Alles pflegt schon längst der Ruh’; (Weber); other data see 143. 172.1 MADAME BUTTERFLY: Eines Tages seh’n wir (Puccini); not published. The following numbers skip and then return to order. 191 DIE LUSTIGEN WEIBER; Er wird mir glauben; see 190. 196 Die Trommel gerühret! (from Egmont) (Beethoven); 196 Die Trommel gerühret! 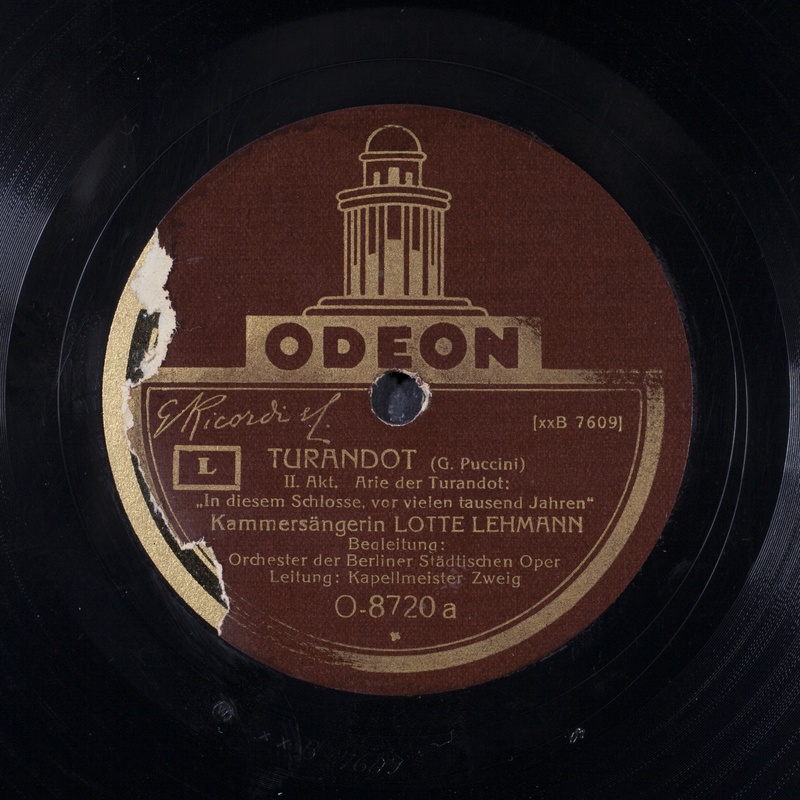 200 MADAME BUTTERFLY: Eines Tages seh’n wir (Puccini); recopying: transfer of 12 inch #178.1 onto a 10-inch side; this done by recording engineers; the artist was not present. 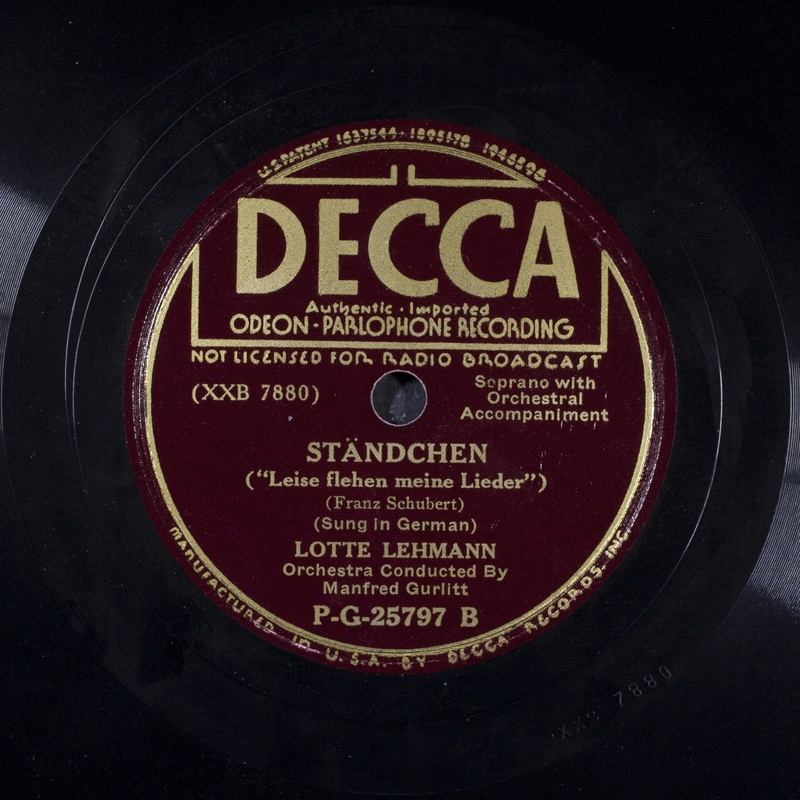 201 DIE TOTE STADT: Glück das mir…(Korngold); an electrically recorded orchestral accompaniment was superimposed on the original acoustic recording. c. Weissmann; the singers, Tauber and Lehmann, were not present. 203 WERTHER: Zum Fenster dringt empor; (Part 2)(Massenet); see 202. 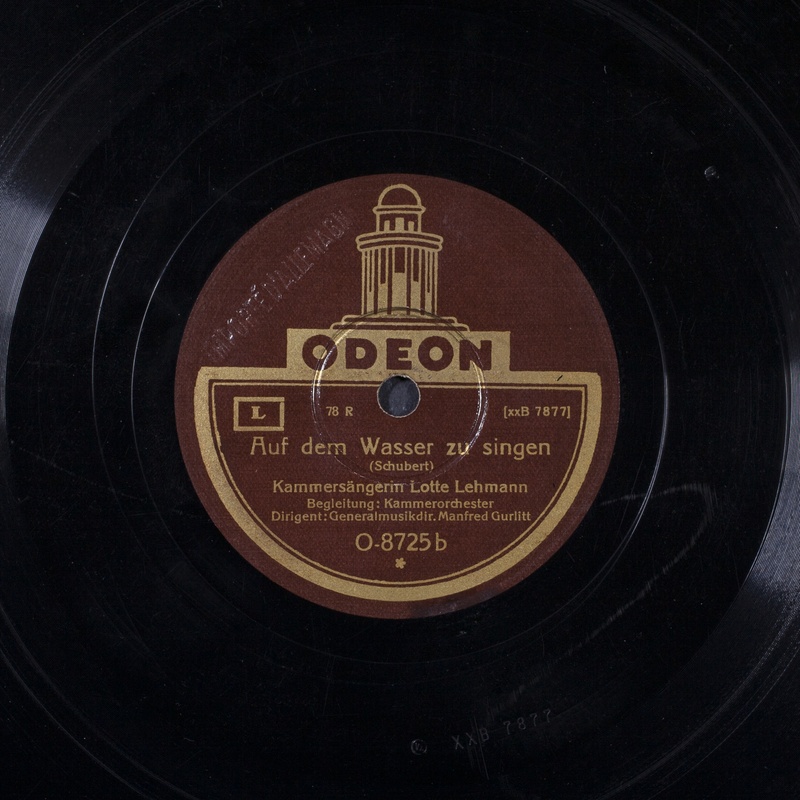 11 Nov. ’33 Berlin State Opera Orchestra; conducted by Richard Jäger; LL’s last session for Odeon took place after she had taken part in the HMV recording of scenes from Der Rosenkavalier on 20-24 Sep. ’33 (see below). 209 ARABELLA: Wie sagt die Zdenka (Part 2); see 208. His Master’s Voice (HMV) 1933-1935 in Vienna. 21 Sep. ’33 DER ROSENKAVALIER; Cast: Richard Mayr, Maria Olszewska, Victor Madin, Elisabeth Schumann, Bella Paalen, Karl Ettl, William Wergnick; Vienna Philharmonic Orchestra; c. Robert Heger. 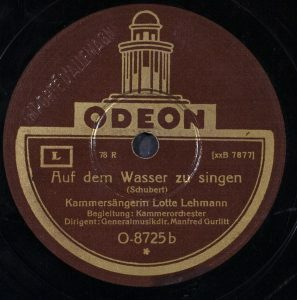 Only those takes on which Lehmann sang are listed. 214 Wie du warst! Wie du bist! ; 214 Wie du warst! Wie du bist! 215 Lachst du mich aus? ; see 214. 217 Ah! Du bist wieder da! ; 217 Ach! Du bist wieder da! 221 Hat sie schon einmal…; unpublished; see 226. 222 Mein Gott, es war nicht mehr als eine Farce…Ich hab’ halt schon einmal..; 222 Mein Gott, es war nicht mehr als eine Farce…Ich hab’ halt schon einmal..
223 Die Stimm’! ; 223 Die Stimm’! 224 Ich werd’ jetzt in die Kirchen geh’n; unpublished; see 227. 225 Muss jetzt partout zu ihr! ; 225 Muss jetzt partout zu ihr! 20 Jun. ’35 DIE WALKÜRE; Cast: Lauritz Melchior, Emanuel List, Ella Flesch, Alfred Jerger. Vienna Philharmonic Orchestra; c. Bruno Walter. 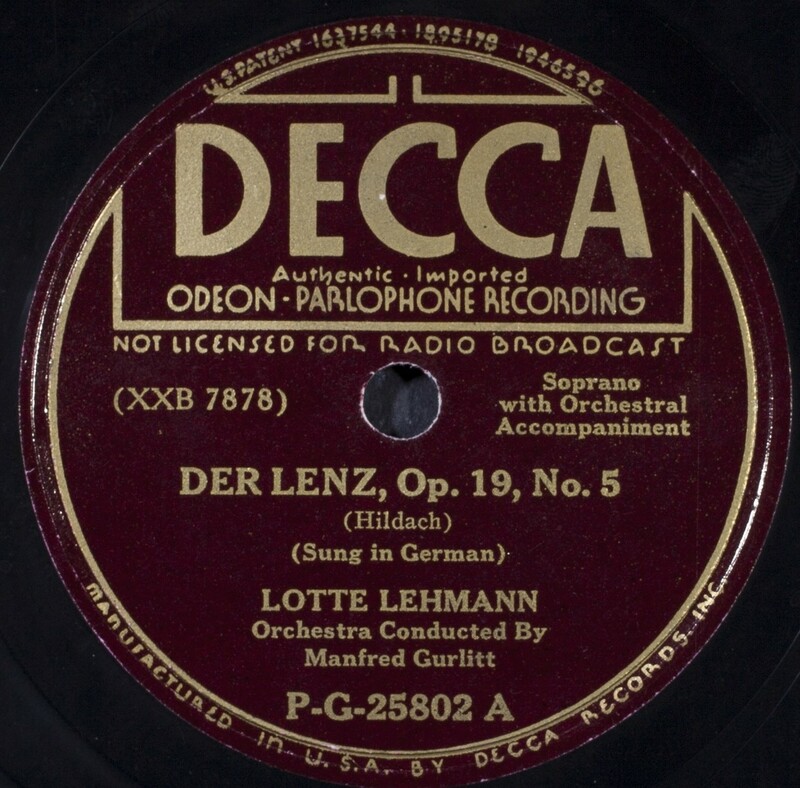 Only Lehmann recordings are listed. 230 Kühlende Labung gab mir; see 229. 232 Müd’ am Herd; (unpublished); see 235.2. 233 Trägst du Sorge; for recording see 235.2. 235 Was gleisst dort hell; see 229. 235.1 Einen Unseligen labtest du; see 231. 235.3 Wunder und wilde Märe; see 233. 239 Wie dir die Stirn; see 238. 243 Hinweg! Hinweg! ; 243 Hinweg! Hinweg! 244 Horch, o Horch! ; 244 Horch, O Horch! 246 Wehwalt! Wehwalt! ; 246 Wehwalt! Wehwalt! 299 a)Täuschung b)Mut! ; 299 Täuschung; 299 Mut! 14 Mar. ’41 songs from Schubert’s Winterreise; pianist, Paul Ulanowsky; you can hear the complete Winterreise cycle on this site. 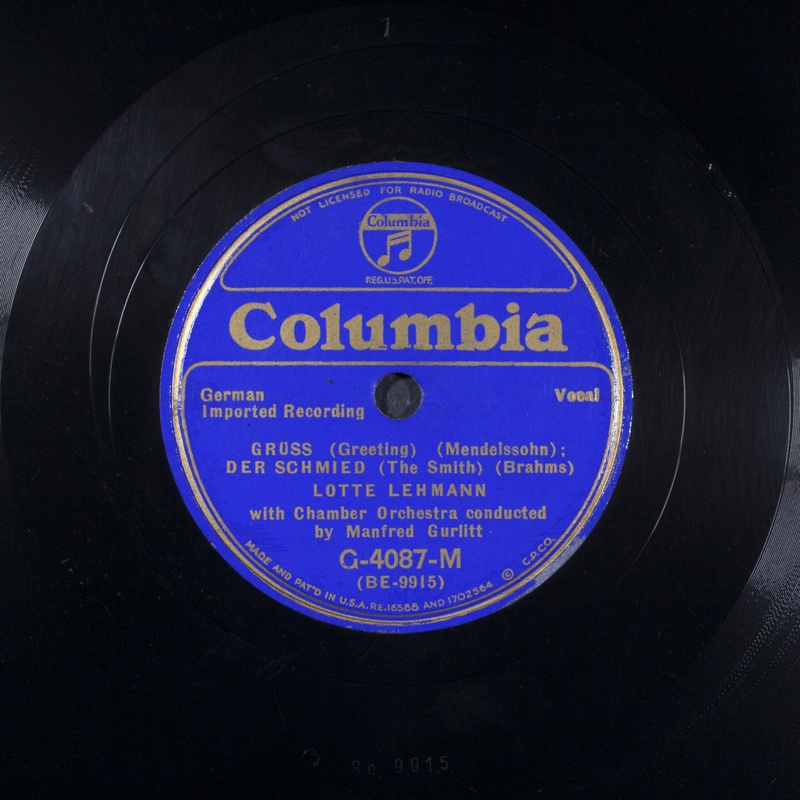 334 Die Lotosblume (Schumann); unpublished; a test pressing may be heard at the Library of Congress. The performance is fine and so is the recording. I see no reason for its not being published. 379 a)Das Wandern b)Wohin? ; a) 379 Das Wandern; b) 379 Wohin? 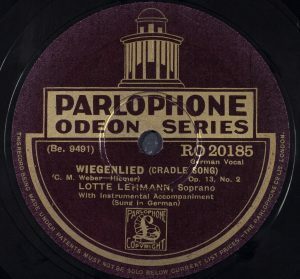 Two lp recordings spoken by Lotte Lehmann. 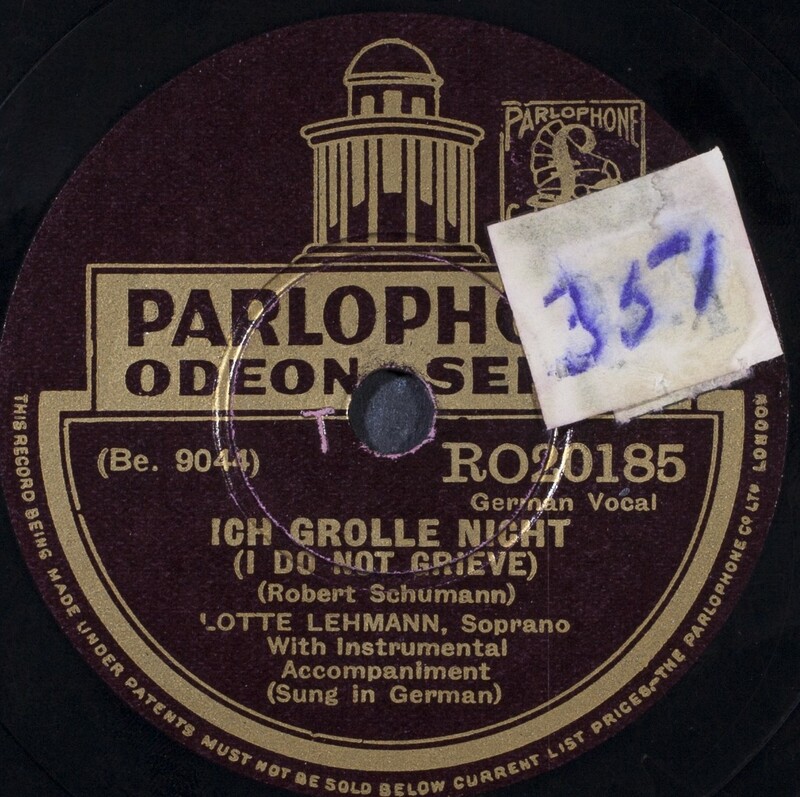 420 “Lotte Lehmann Reading German Lyric Poetry” (in German); October 1956; Caedmon TC 1072; Goethe: Mignon; Ganymed, Wanderers Nachtlied, Geheimes, Als ich auf dem Euphrat schiffte; Mörike: Peregrina I, Gebet, Im Frühling, Der Genesene an die Hoffnung, Begegnung, Nimmersatte Liebe, Verborgenheit; Heine: Dichterliebe; Rilke: Ich lebe mein leben in wachsenden Ringen; von Hofmannsthal: DER ROSENKAVALIER monologue from act 1; Müller: Winterreise. 421 “Rainer Maria Rilke: Die Weise von Liebe und Tod; Marienleben; Read by Lehmann”; (in Ger. ); late Feb.-Mar. ’58; Cademon TC 1128.